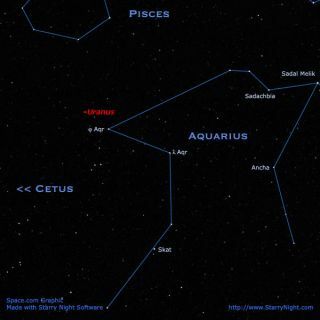 Uranus can be found high in the southern sky after midnight, floating just off the corner of Aquarius. Try using the ö and ë stars as pointers. Here is a trivia question: How many planets arevisible without a telescope? Most will answer "five" (Mercury, Venus,Mars, Jupiter and Saturn). Some might answer "six" and include theEarth in the mix. Six, in fact, is the correct number, but if you exclude ourown world, there is indeed one other planet that can be spied without opticalaid: the planetUranus. This week will be a fine time to try and seek it out,especially since it is now favorably placed for viewing in our evening sky andthe waxing moon is not overly bright. Of course, you'll have to know exactly where to lookfor it. Barely discernable by a keen naked eye on very dark, clear nights, Uranus — currently shining at magnitude +5.7 — is now visible during the evening hoursamong the stars of Aquarius, the Water Carrier. On this scale, larger numbersare dimmer, with magnitude 6.0 being about the dimmest object visible underideal, dark-sky conditions. It is best to study the accompanying chart first, and thenscan that region with binoculars. Using a magnification of 150 power with atelescope of at least three-inch aperture, you should be able to resolve itinto a tiny, pale-green featureless disk. Uranus, which currently lies 1.868 billion miles (3.005billion kilometers) from the sun, has a diameter of about 31,700 miles (51,120kilometers) and according to flyby magnetic data from Voyager 2 in 1986, has arotation period of 17.4 hours. At last count, Uranus has 27 moons, alllying in orbits around the planet's equator in which there is also a complex ofnine narrow, nearly opaque rings, which were discovered in 1978. Uranus likely has a rocky core, surrounded by a liquidmantle of water, methane, and ammonia, encased in an atmosphere of hydrogen andhelium. A bizarre feature is how far over Uranus is tipped. Its north pole lies98 degrees from being directly perpendicular to its orbit plane. Thus, itsseasons are extreme: When the sun rises at its north pole, it stays up for 42Earth-years; then it sets and the north pole is in darkness for 42 Earth-years. The British astronomer Sir William Herschel discoveredUranus on March 13, 1781, noting that it was moving slowly through theconstellation Gemini. Initially, however, Herschel thought he had discovered anew comet. Soon the name of Herschel became known over all of Europe together with the news of his discovery. King George III, who loved the sciences,had the astronomer presented to him, and bestowed upon him a life pension and aresidence at Slough, in the neighborhood of Windsor Castle. Eventually it was determined that Herschel's"comet" was, in fact, a new planet. For a while, it actually boreHerschel's name. Herschel himself proposed the name Georgium Sidus — "TheStar of George," after his benefactor. However, the custom of using mythological names ultimately prevailed and the new planet was finallychristened Uranus. Prior to its discovery, the outermost planet was consideredto be Saturn, named for the ancient god of time and destiny, but Uranus was thefather of Saturn and considered the most ancient deity of all. It probably was for all for the best. After all, if Herschel'srequest was granted, just think of how we might have listed the planets inorder from the sun: Mercury, Venus, Earth, Mars, Jupiter, Saturn and . . .George?